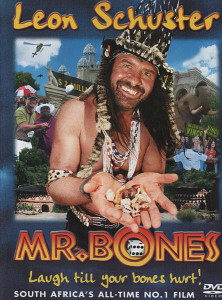 In this comedy, Mr. Bones is the bone-throwing prophesier for an African kingdom. The king longs for a male child to be heir to the throne, but has fathered only daughters. He gives up hope until he remembers fathering a boy decades before, and he sends Mr. Bones to find the prince.At the same time golf star Vince "The Prince" Lee arrives in the city for a golf tournament. Vince nearly wins the game until Mr. Bones stops a perfect putt because he believes Vince to be the prince. Vince retires in disgrace, but meets a local singer named Laleti afterwards, whom he is infatuated with. Mr. Bones kidnaps Vince and introduces him to King Tsonga, but after discovering that Vince is terrified of animals, King Tsonga disowns him and prepares to die. When Laleti is threatened by a lion, Vince overcomes his fear and chases the lion away. King Tsonga sees this, and decides that he doesn't want to die. King Tsonga proclaims that Vince is his son, but asks Mr. Bones to throw his prophesy bones once more just to be sure. Mr. Bones does this, and it is confirmed that he is the actual prince.